AUGUSTA, Maine — Paul LePage is once again catching flak for his tendency for blunt, off-the-cuff remarks after the GOP gubernatorial candidate suggested he might tell President Obama to “go to hell” and made a comment about wanting to slug a reporter. LePage, for his part, acknowledged that he needs to do a better job toning down his language, especially in a modern campaign in which virtually every public appearance by a candidate is recorded by “video trackers” hired by their competitors. But even as LePage’s rivals used the most recent incidents to question his temperament and fitness for the Blaine House, the Waterville Republican said not to expect much polish with him. The most recent flap emerged the same day that a new poll suggested that LePage’s commanding lead over the pack has evaporated, making the race a statistical dead heat. The survey by Portland-based Critical Insights polling gave Democrat Libby Mitchell a slight lead for the first time at 30 percent followed by LePage at 29 percent. Independents Eliot Cutler and Shawn Moody trailed at 9 percent and 5 percent, respectively. The survey of 405 registered voters was conducted Monday and has a margin of error of 4.9 percent. The results were a stark departure from those of other recent polls showing LePage leading Mitchell by double digits. For his part, LePage said he isn’t concerned with polls and would run his race the same way regardless of what they say. LePage’s characteristic bluntness — or hotheadedness, according to his critics — landed him in the spotlight again Tuesday when he told an anchor with the Maine Public Broadcasting Network that he was “about ready to punch” one of MPBN’s reporters. During back-and-forth conversation before the official taping began — but while the cameras and microphones were recording — anchor Jennifer Rooks told LePage that two MPBN radio reporters also wanted to speak with him. LePage: “I’m about ready to punch A. J. Higgins,” referring to MPBN’s State House correspondent. Watch the full episode. See more MPBN News. In an interview Wednesday afternoon, LePage said he knew he was being recorded and intended the statement as a joke. LePage said he spoke with Higgins — a former Bangor Daily News reporter — on Wednesday and that he felt assured that it was taken as a joke. He then said with a laugh that the two agreed to grab a beer together — but would leave the boxing gloves at home. Higgins on Wednesday said he accepted LePage’s explanation. LePage’s critics are not laughing, however. “Joke or not, the threat of violence is not acceptable, and I think candidates for governor should really serve as a role model,” said Arden Manning, manager of the Maine Democratic Party’s 2010 campaign effort. 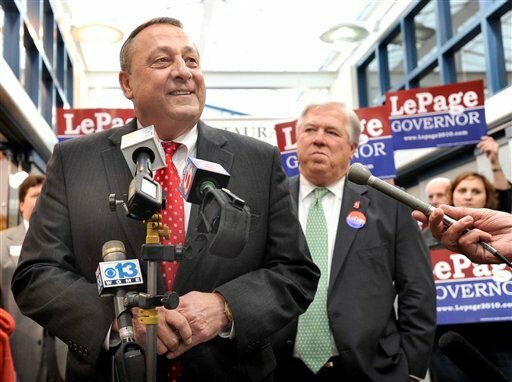 News of the punch comment comes on the heels of a video posted online Tuesday showing LePage telling a crowd of fishermen that, if elected, they can expect to see him stand up to the Obama administration. Only LePage didn’t put it quite as nicely. “As your governor, you’re going to be seeing a lot of me on the front page, saying ‘Governor LePage tells Obama to go to hell,’” LePage said, sparking applause from the largely GOP crowd. Not surprisingly, LePage’s rivals are using the incidents — as well as past LePage outbursts and off-color utterances — to paint an entirely different picture of the candidate. Asked about LePage’s comment toward the president, independent Eliot Cutler said he believes it is inappropriate to tell any president — whether Obama or President George W. Bush — to go to hell or to “get out of my state,” a reference to an earlier LePage comment. 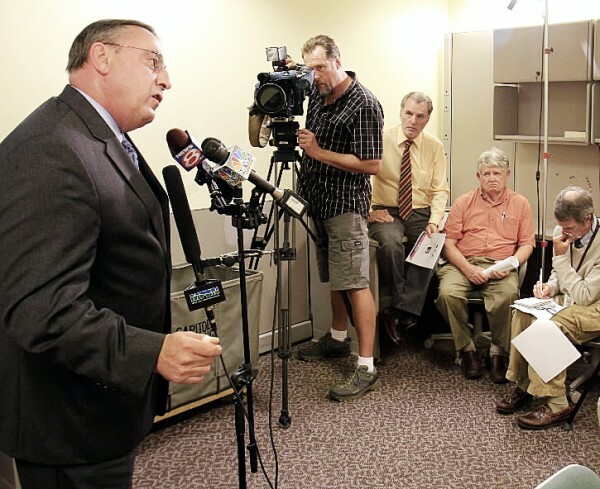 LePage has had an uneasy relationship with the press ever since he walked away from the June 8 GOP primary with a commanding victory over his six competitors. He has consistently been the least accessible candidate to the media — even as he has led in the polls — and his campaign has directed reporters to submit questions in writing. Earlier this month, he angrily ended a press conference and stormed out of the room when pressed by Higgins and other reporters for answers to questions about his wife’s residency status and the couple’s taxes. Later in the day, he used an obscenity in response to another MPBN reporter’s question along the same lines. In interviews Wednesday, LePage expressed regret about his word choice regarding the president, but said he was angry that Maine fishermen have been put out of work due to what he described as federal overregulation. That said, LePage joked that his daughter, who works on his campaign, just gave him a roll of duct tape for his mouth.